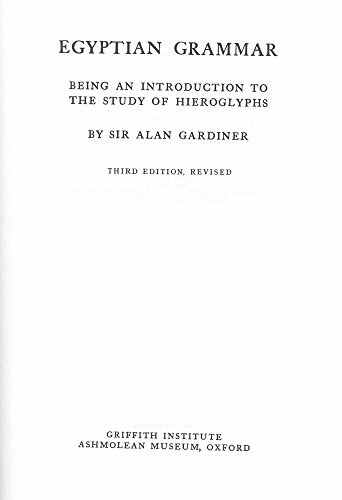 Although the first edition of the study appeared over seventy years ago, Gardiner's Egyptian Grammar remains the most comprehensive presentation of Middle Egyptian available, and is still an essential reference tool for all advanced work in the language. The latest, third, edition, appeared in 1957 and is now in its tenth reprinting. After each new element of grammar the learner is given a set of exercises, and the book also contains useful resources such as a list of hieroglyphic signs and information about the development of the language. If you have any questions about this product by Brand: Griffith Institute, contact us by completing and submitting the form below. If you are looking for a specif part number, please include it with your message.